Glentoran will take on Premiership giants Manchester United in a glamour friendly next summer to mark the Irish League club's 125th anniversary. 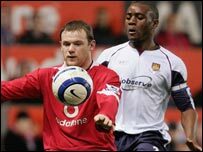 Wayne Rooney could be among the stars at the Oval after United promised to bring over their top players. Old Trafford legend George Best played for the Glens against the Red Devils in the Belfast club's centenary match. United boss Sir Alex Ferguson also has a link to Glentoran as his father once played for the club. Best watched the Glens in his youth but was rejected as a player for being "too small and light". A date for the friendly has yet to be confirmed.